FEATURE: Two protagonists, Ortega and Saracevic recall memories of perhaps the greatest handball duels of all time at the end of the 90s. Carlos Ortega and Zlatko Saracevic are two household names in the world of handball. The Spanish and Croatian greats played against each other in each and every game of the trilogy of EHF Champions League finals, which most remember as some of the greatest duels in the history of the game. 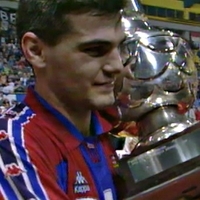 Zlatko Saracevic is a Zagreb legend, who played in all three finals these two handball giants contested in 1990s. His memories from that time are not very positive because Zagreb ended up losing all three clashes but he says that nothing was normal in their final encounters. “What I remember from these matches is that they were all weird and I mean that when I say it. Nothing was normal in these matches we played against Barcelona in Barcelona or in Zagreb. Barcelona won all three consecutive finals; what’s more, all games apart from one: the first leg of the 1999 final, which ended in a draw in Zagreb. “That game was crazy. I remember we arrived in Zagreb and streets were empty. Police closed the traffic and we were driven to the arena with heavy police support all around us. I really felt it was going to be the fiercest game and it proved to be true later,” recalled Ortega. “I remember when our coach Velimir Kljaic was leading us from the stands but was talking on the phone with his assistant who could barely hear what he was saying. Those matches were just crazy,” Zlatko Saracevic starts his story. Matches between Zagreb and Barcelona were all really tough. Zagreb always knew they were underdogs and were looking for their chances to beat them in Zagreb. “I never lost against Zagreb and as far as I can remember I always had great games against them. I always did well when the stakes were high and in those days Barcelona and Zagreb were the best teams in the world. It doesn’t get any better than that,” claims Ortega. Saracevic also praises Barcelona’s players who were just too good and Zagreb could not find a way to be better than them. “I referred to those games as war but I must add that there was also great respect for each other. In the heat of the battle you do nasty things sometimes but it is driven by the sense that you have to give your all to beat your fiercest opponents,” concludes Ortega.